I invite you to join me aboard the Darjeeling Limited. 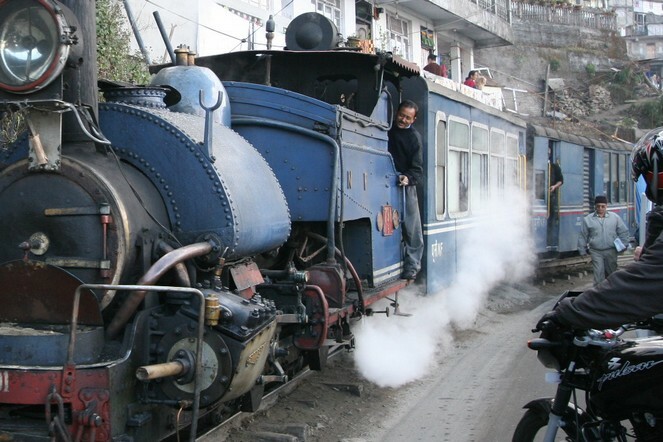 The steam engine belches out swirls of white smoke, its whistle echoes around the valley, and in a few moments it will set off in the direction of 2013. I don’t have reindeer or a sleigh to offer you from the countries I travel around so frequently. However, in terms of a sack, I do have something for you. I wish you much happiness, and some lovely surprises beneath the tree. 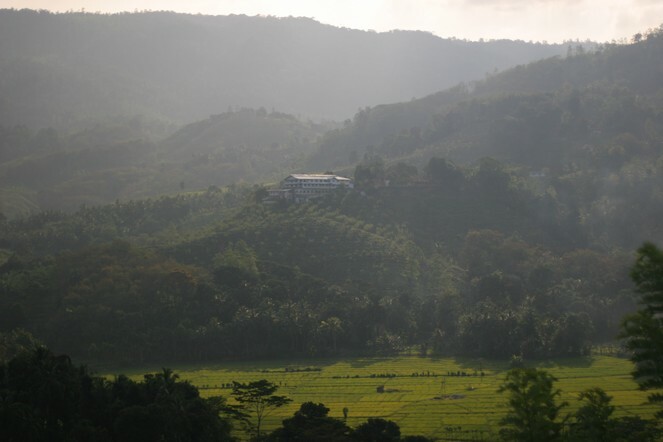 On the tea plantations, the midday meal is a proper break. 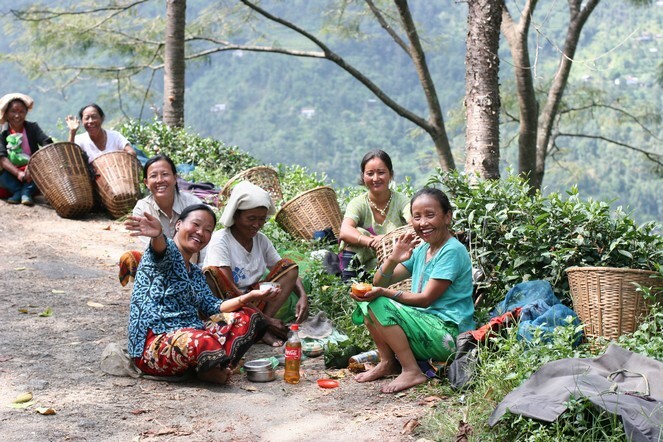 Here, in Darjeeling, everyone gets their food out from their bag and sits down to eat, outdoors and in good spirits. The recycled cola bottles contain… tea! 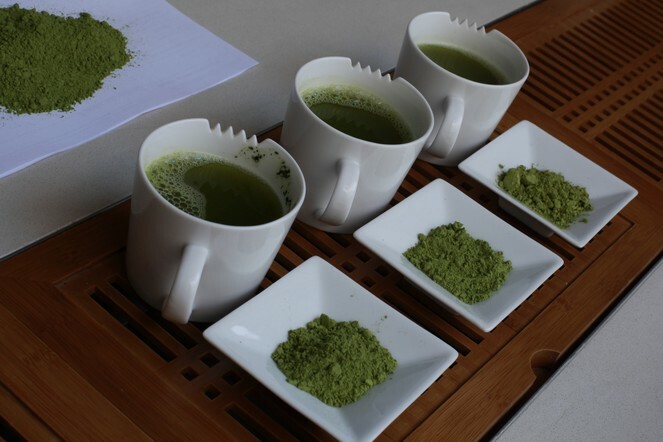 During the oxidation process the tea leaves change colour, from green to brown. This only applies to black teas, of course. Experience is everything when it comes to knowing when to end this stage. 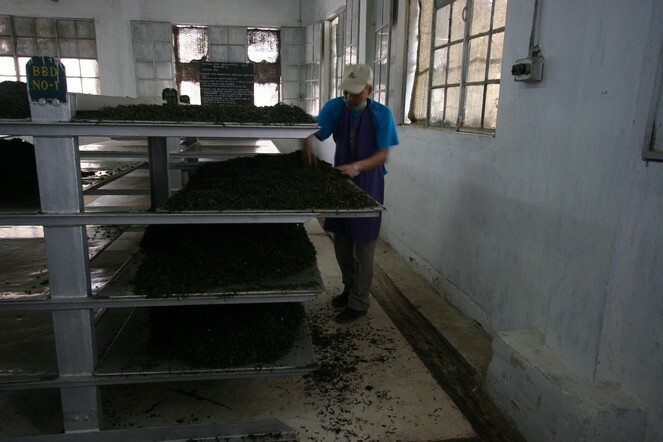 The factory manager must assess the colour of the leaves and their aroma, to decide if the tea has oxidised enough and it is time to dry it. 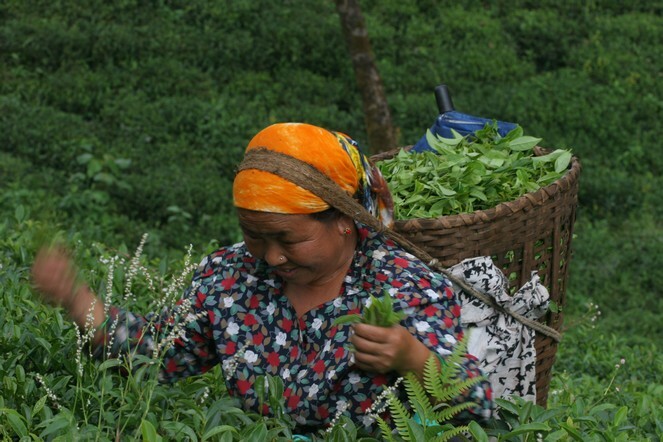 This charming Nepalese tea plucker is setting off with her basket to harvest the young shoots of the tea bushes. She reminds me of you all who, at this festive time of year, are out looking for things that will make your loved-ones happy. 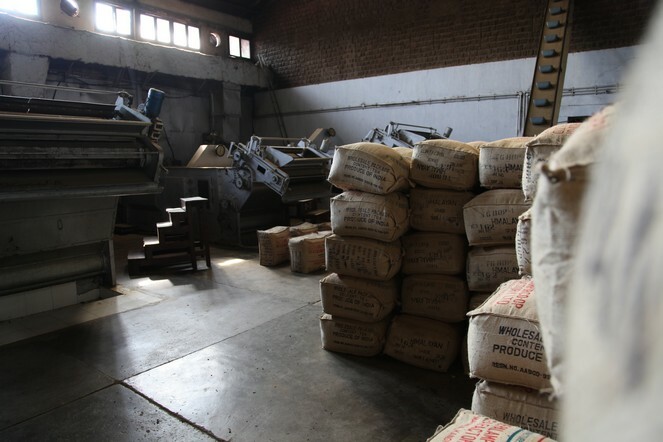 The buildings in which tea is processed are full of smells. Wilting produces the most pronounced aromas, while it is taking place, giving off vegetal, floral bouquets. The smell is so powerful, it literally transports you. 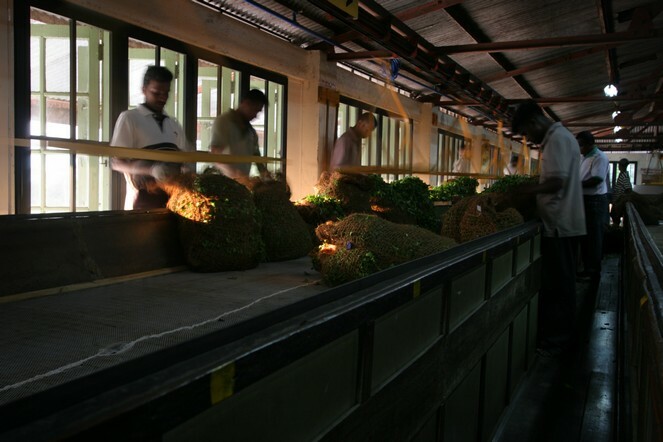 However, if you visit a tea factory outside the production season, like here at the Palampur Co-operative (India), other aromas are more dominant. You find yourself shutting your eyes to better appreciate the powerful smell of straw and horse hair. Sometimes you find green particles in black tea that are not the pale-green buds that often accompany a fine pluck. The particles I’m talking about here come either from the rolling process, if the leaves get slightly broken, or when leaves that are a bit too big are put through a machine like this one, to make them smaller. 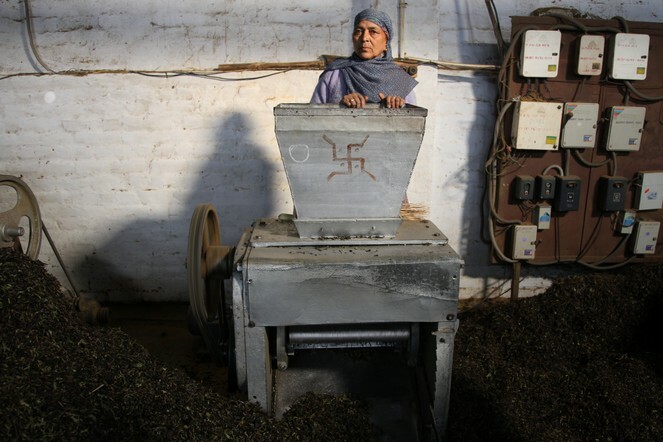 Note the serious expression of this worker, who appears to blend in with her machine.